When it comes to talking about the best shows of 2014 we think it will be very hard not to be excited about "Ring of Diamonds". The show, put together to celebrate Ohashi Gym's 20th anniversary features the bets of Ohashi's fighters and is sure to go down a genuine storm. The bouts on it include Naoya Inoue's long awaited world title fight as he battles Adrian Hernandez for the WBC Light Flyweight and Akira Yaegashi defending his WBC Flyweight title against Odilon Zaleta. 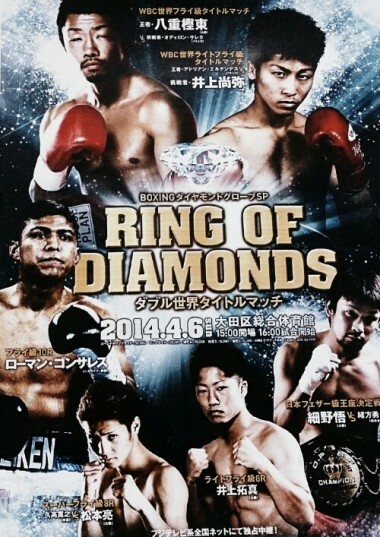 As for the poster it's actually a clever one and shows off the "diamonds" of the ring. These are Akira Yaegashi (top left), Naoya Inoue (top right), Roman Gonzalez (middle left), Satoshi Hosono (middle right), Ryo Matsumoto (bottom left) and Takuma Inoue (bottom right). With those men you are looking at some of the best emerging fights and two of the very elite current fighters. Brilliant poster and brilliant idea.